05 of 20. This is a picture of 2 color 360 degrees all around print ornaments in two colors: dark green and purple. 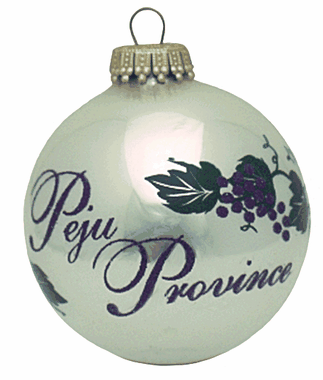 The front of the ornament showcases the name of the province and the design is complemented with nice grape vine design in those two colors. This design was created for vineyard's gift shop. This is called 2 color 360 Degree all around Screen Print ornament. To cost this design check out our SPECIALS! MINIMUM QUANTITY IS 144 ORNAMENTS in this product line, regular price would be $5.25 for 2-5/8 printed ornament and $6.25 for our 3-1/4 ornament as this is a 2 color print.